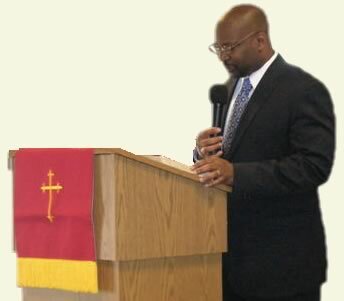 Pastor John Crayton Not knowing what the future would bring, John left home at the age of 15. It was during this time he attended a powerful street service that captured his heart. At the age of 18, his faith increased when God healed his daughter from yellow jaundice. This was the turning point when John stopped playing church and grew spiritually. Five years later, in the Community Holiness Church of God For All People, he became a Deacon, then an Ordained Minister, and an Assistant Youth Pastor. After serving faithfully in this ministry for fifteen years, John exercised another level of faith and moved on. The Spirit led him to Christ Church of Universal Love where he served as an Assistant Youth Pastor for two years. Once again, not knowing what the future would bring, he left the comfort of Shiloh Missionary Baptist Church and went out into the wilderness. It was during this part of his journey that the vision of Christlike Fellowship was born. Holy Bible Then the LORD replied: “Write down the revelation and make it plain on tablets so that a herald may run with it. For the revelation awaits an appointed time; it speaks of the end and will not prove false. Though it linger, wait for it; it will certainly come and will not delay. To enrich the lives of every person that comes to and through this ministry, so that they and their family can be made whole and better according to their need and the word of God. By this we can accomplish our mission of making disciples of all men according to the scripture. Making disciples of all men according to the scriptures. To teach new members about what they have joined, what we believe in and their rights and responsibilities as a Christian. To show them love and how much we appreciate them for coming out to worship with us. To provide transportation for those who would like to attend worship service, bible study and/or other church fellowships. For more information or to schedule a pick up, please call 727-288-1745. To provide assistance to those in need according to the problem and the resources available – both spiritual and physical. To help our members grow personally and spiritually through biblical trainings that enhances their individual journey of faith and well-being.